Real estate technology funding is on track to reach another high. In the first quarter of this year, emerging tech companies closed 61 deals and received $733 million in funding. 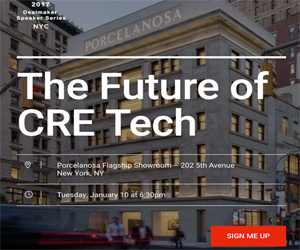 According to CB Insights, if the current investment rates continue, real estate tech company funding could reach $2.9 billion, a 10% increase year-over-year in raised capital. The niche is tracking to close the year with 247 deals, which is an 11% decrease in deal activity from 2016. Note that last year real estate tech investing recorded an exceptional year, with 277 deals leading to $2.6 billion in funding. The trend for the last three-quarters in the real estate tech company category has been a decreasing number of deals but increasing funding. One notable deal that closed in the first quarter of 2017 was a $375 million corporate minority financing to HomeLink, a Chinese real estate firm. Knock, an Atlanta-based residential sales platform, received a $32.5 Series A deal led by RRE Ventures in Quarter 1. Nearly 34% of all the total deals in the first quarter are early stage, angel, or series A, compared to over 65% of all 2016’s deal share. Series B represented 7% of quarter 1’s deal share. No Series C deals closed in the same quarter, while Series D+ deals comprised 5% of all funding deals. Other types of deals, like corporate minority and venture capital rounds, reach 25% of the quarter’s deal share. CBInsights defines real estate technology as the software used by all professionals involved in the industry, including mortgage providers, investors, and property managers. It does not include travel rental services or property owners.